This is the new feature on ILB that is meant to centralize the rewards for our events and enables us to provide better and more valuable rewards to our players. 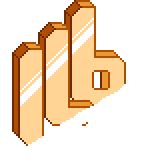 The way it works is simple, by participating in ILB events and other activities you win spin codes, every code is one-time use and has a guaranteed prize that will be logged and later awarded to you by us! Ways to get Spin Codes. This is self-explanatory, at some point a lucky spinner will hit this jackpot! We will support you with one commission with one of our artists and/or modders. This can be things like One Avatar; Starbound Item; Starbound Costume; Starbound Item; support with one creation you're struggling with. This will allow you to claim one custom role name and color on our Discord Server, over that, you will be able to award that role to up to 3 other users. Each Discord team role lasts for 3 months, after that period you can extend it by spending your bCash (earned by participating on bSports here on the website), or earning another team role prize. You can also use bCash or an extra team prize to add more users you can give you role to in our Discord Server. This will allow you to claim up to 4 Games from our library, you can find it here. This will give you points in our bSports system, bSports gives you a lot of trophies to level up and earn more permissions here and in our Discord server. You can also use that bCash to buy certain things (as described on the Discord Team Role). By this, we mean Hall of Fame, we will release a permanent addition to our Starbound Server HUBs, on this HUB we will place statues with messages of our players of relevance over the time, immortalizing them in a virtual way. Voting for our Starbound Server - right now you can vote and win badges, we have extended that to the Spin Codes; 4 people that voted over 15 times will be given spin codes every month (All votes over 15 increase chances)! Vote sidebar always appear on the site homepage! More Info. Server Events - We have been working on increasing the frequency of our events and expanding them beyond the Starbound server, we will be always awarding Spin Tokens from now on for everything we do! Aside from our Discord Server, you will find them announced on this forum! This includes Starbound Server, Community & Starbound Roleplay events. Using our Discord Server (invite here) - We will time to time do flash giveaways of a spin code on our discord server so stay tuned! Playing in our Starbound Server - One of our bots will at random times post a Spin Code on the Universe chat! Patreon iLoveBacons (page here) - As a thank you for the continuous support of our Patrons on the maintenance of our server, we will be giving them the opportunity to choose a member of the community to be given a code, the Patreon will get the same reward as the member (excluding Gift Cards and Commissions).